Tour was the Best we had in Europe. We highly recommend him. His services are personable and extremely knowledgeable. Not only were you a wonderful guide, you also opened our eyes to the rich, rich heritage that Greece had given the world, and beyond all that you became a wonderful friend. He made our day in Athens memorable! Thank you, dear Vassilis, for a wonderful day in Athens, We enjoyed very much. recommend to all our friend to use your services when visiting Athens. We had a great tour, very informative. We saw all best sites. The restaurant he recommended for lunch was delicious & reasonable. I would highly recommend him. We had a wonderful time. Mr. Vassilis !!! Thank you very much for everything and for a great tour. This was the best way to see Athens. Thank you for a beautiful day. Outstanding! We had a wonderful time and would recommend to anyone. You will see and do more than you can imagine! We got really lucky and hat the BEST tour ever! Vassilis is so friendly and such good company. I will recommend him to everyone i know who is going to Greece! Thank you Vassilis for a wonderful day. We love the personalized service from our proud new friend from Hellas. Wonderful lunch recommendation, great pace all day to see so many sights, we enjoyed our education of Greek culture – an eye opening perspective on a wonderful culture. Great Experience in Athens. Prompt airport pick-up, professional demeanor, lots of information about this wonderful country and its very special history. Thanks – Hope to see you again. We had a great time, Vassilis was very knowledgeable about both Greek and US culture. He also had great pointers on how to avoid the crowd (big plus)! He took us to a great traditional Greek restaurant away from the tourist area. 5 Stars from the Jetta Family! Great tour to Athens that many people do not often see. Vassilis is very informative and very friendly. We will be back next year and I will request his services again. Highly recommend his company, he is very proud of his country and it shows. Mabuhay and salamat (hi and thank you). Second day at work and I’m still dreaming of Greece! We arrived very early in the morning yesterday and went straight to tons of things to do at the office! I remember your “gospel” of taking it easy and enjoying life while we still can. Now I’m thinking why was I not born Greek? Ha ha ha. If I am, I’ll be driving to the beach immediately after work – everyday! As I said, I’m a son of the beach, remember? Ha ha ha. Anyway, just a short note to thank you for driving us around and taking us “off the beaten track”. I’m sure most tourist have not seen the places you took us to. It sure gave us a broader perspective of the Greek culture and lifestyle. It’s just sad that we didn’t have enough time. At least, there are more reason to go back in the future. I learned more things talking to you than when I was listening to my history and art teachers. Well honestly, I rarely listened in class anyway. For sure, I’ll go back to reading my Greek literature and art books again. And whilst I’m doing it, I’ll be reminded of you. You’ve been great and will definitely tell my friends (who are planning to go to Greece) about you. I just do hope you won’t get tired of doing what you do as it will be a big loss. If you’ll have the chance to visit Dubai (or Manila) in the future, let us know and we’ll be more than happy to take you around. We don’t drive the latest Mercedes like you do but we’ll make sure you’ll enjoy it nevertheless ha ha. Again, thank you very much. Keep well. We have had the most wonderful day of touring with you! We have been taken to The most interesting and fascinating places, more than we expected. Your knowledge Of your city + its history is extensive, + your personality is delightful ! Extremely knowledgeable and friendly. Made Athens a wonderful experience in the short amount of time we had here, without his experience and professionalism we would have not got to experience what Athens really has to offer. Many Thanks! Highly recommend to anyone from any country. You change my idea of Athens! Thanks, we had a great day. Loved Athens and the tour.. We learned a lot about the influential Greek and culture. Thanks for a wonderful day of sights, history and discussion! We had a wonderful time and will difinitely recommend you to anyone who has the good fortune to visit this glorious city. We wish you all the best in life and love! We had a wonderful time on the tour and it was great to learn about the city, history and culture from someone local + knowledgeable who was also a lot of fun to talk with! Thank you for a great day in the city! Thank you for giving us a wonderful tour of Athens. Your insight into the Greek culture and history gave us an inside look at the way Greeks live today and in the past. We will definitely recommend you to friends and family who visit Athens. Greece has such a rich, inspiring history. It is wonderful to see & feel the history i have only read about. You are a terrific guide, knowledgeable and funny! You have a great understanding of all things. Thank you for a great day. VASSILIS- THANK YOU FOR A WONDERFUL INDRODUCTION TO GREECE. WE SAW THE TYPICAL SITES WE EXPECTED PLUS A NUMBER OF SITES WE WOULDNT HAVE SEEN WITHOUT YOUR HELP. WE ALSO APPRECIATED YOUR PERSPECTIVE & PRIDE IN YOUR AMAZING COUNTRY. THANKS FOR A GREAT DAY. Had a Great time exceeded expectations. Awesome experience! An overall look at Athens + area – Done exactly what and how we wanted. As old people, it was paced to meet our “slow” needs. Vassilis was very informative in every way, would recommend him to everyone. GREAT!! Vassili was very friendly and has local knowledge about Athens. He was very patient and showed us the highlights of Athens in one short afternoon. I would highly recommend his service to anyone visiting the Area. Very accommodating with very clean Taxi. my friends to call him when in Greece. A wonderful day with a knowledgeable and extremely pleasant man…. Vassili, you give a first rate all round tour and historical perspective of the great Athenian culture. I am very Lucky to have run into you for my day tour of Athens. It was a great pleasure being with you – We had a wonderful Time. We saw a lot of Athens and you gave us a great idea of knowledge about your country. – We hope to be with you again soon. Vassilis was extremely personable, helpful and very knowlegable of his beloved Greece. He trully went at our pace and showed us what we wanted to see the most. We enjoyed every minute on our day we would recommend Vassilis to everyone. Because I had a stop at Athens for 9 hours during my trip from Amsterdam and Tel Aviv, I decided to hire a personal tour guide in order to show me the city. After searching the internet I choose Vassilis to show me around. He picked me up from the airport and started driving to the center of Athens. On the way to the city Vassilis started to inform me and explain about Greece and Athens. It is obvious he is very proud of his country. Maybe, sometimes a little bit too much. But I guess a proud tour guide is the best tour guide you can get and there is a lot to be proud of. Anyways, we went to the Acropolis, the Olympic stadium and the the old city. It was nice to get some background information from Vassilis. Although a couple of hours is way to short to discover a city, thanks to Vassilis I got a good impression I think. Next time, when I have a stop at Athens I will certainly ask Vassilis again to show me some places outside Athens and would also recommend him to my friends. He is an excellent guide and a warm person! We find Vassilios by accident in a lucky day in Plaka,since then we have enjoyed his company and his very good services,he took us to two trips outside Athens and both were memorable. Thanks Vassilis for the good times. to see Athens with Vassilis. I would recommend to anyone. From the moment Vassilis met us at the airport our wonderful Greek expirience began. We felt welcomed and well taken care. Vassilis was friendly and professional. that will last a lifetime. We will recommend Vassilis to all our friends. all the great sites. We recommend this tour to everyone. A day spent in Athens with Vassili is a day well spent. We were given the best taste of the city’s cultural and historical tradition. We will most definitely be back !. but exemplifies Greece, we would highly recommend these private tours. I feel lucky to find such a professional punctual and safe driver to take us to Delphi -Ask him to take you to the nearby restaurant for lunch if you appreciate good, simple food. Merci a mr Vassilis nous avons passe ensemble une belle journe a mycaenes. Vassili knowledge. I trully recommend him to anyone. Thank you. We had a very great tour! Very accommodating and informative, Highly recommended!! My wife and I have had the most wonderful time in Greece in so many ways, Thanks to Vassilis and his Family. He always was a reliable guide, careful driver But before everything an honest friend. Thanks to him I met many of the faces of Greece. The artistic, the cultural, the marine , the religious Greece was shown to us with the good and accurate guidance of Vassilis. For sure I recommend your services and I hope to see you soon ( on my future trip to Greece). Regards to all your kind family. Dave and I both had a great time and enjoyed your personalized tour very much. We both learned a lot about your beautiful country from you, and saw sights we would never have had a chance to see on our own. I will highly recommend you to any friends or clients that are visiting Greece. Excellent service . Personable, knowledgeable, very good English. Impeccably clean spacious car. We plan to engage him again in July. 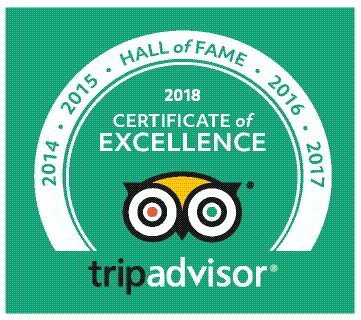 We Get The Certificate of Excellence From TripAdvisor Every Year!